The acclaimed Edinburgh ensemble Mr McFall's Chamber makes its first outings of the 2010/11 season on Thursday December 16th (St Bride's Church, Hyndland Road, Glasgow) and Friday 17th (St Mark’s Unitarian Church, Castle Terrace, Edinburgh). Both performances begin at 7.30, and are preceded at 6.30 by a conversation between Robert McFall, the ensemble's leader, and composer James Clapperton. 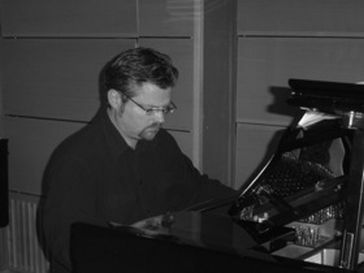 After three eclectic and genre-bending shows earlier in the year, featuring successively the folk/techno of Martyn Bennett, singer/songwriter Michael Marra, and a Tango night showcasing Astor Piazzola, Facing North turns to a more traditionally 'classical' repertoire—though characteristically the works chosen include two recent contributions, Olli Mustonen's Toccata (1989), and James Clapperton's Den som ingen ser (2007), alongside Shostakovich’s Piano Quintet. Rounding the programme out are some Grieg string pieces in an arrangement by Robert McFall, and a fragment of a piano quintet found in Grieg's sketchbook. The Grieg fragments afford the connection to Clapperton's Den som ingen ser, commissioned to mark the 100th anniversary of Grieg's death. Clapperton himself is a frequent visitor to Norway. As a soloist and orchestral pianist, he is in demand especially as an interpreter of modernist music. (When I spoke to him last week, he was just back from St Petersburg, having played Boulez and Berio under the gaze of the celebrated portraits of Mussorgsky, Tchaikovsky and Glinka.) As a composer, though, he made a conscious decision in his early 20s to distance himself from that style, feeling that the boundaries of complexity had been so thoroughly explored (in the solo piano repertoire) that it was difficult to conceive of making an original contribution. Den som ingen ser, then, germinated from fragments of Grieg. Clapperton proceeded not by quoting, but by exploring the harmonic language and its possibilities. He cites Berio's Renderings as a model, where Berio took fragments of Schubert's symphonic sketches and created a tissue of connective material in Berio's own style. Clapperton was intrigued by certain parallels between Schubert's harmonies and Grieg's, discovering the latter to be experimenting with that characteristically disconcerting flip from major to minor to major that is so familiar from Schubert's oevre. Alongside the harmonic exploration there are references to Grieg's folketoner element, using traditional melodies that are hymn-like and often minor-key and melancholy. But this is a contemporary work, and the elements of melody and tonal/modal harmony are crafted into a formal design that right from the opening resists conventional rhetoric. In a sense, the work is a theme and variations, but the 'theme' is a worked-out conclusion rather than an initial gesture. In place of an exposition, the work begins with a kind of non-polyphonic polyphony, meaning that the process of exploration finds each of the instrumental lines making the acquaintance of their neighbours. Things are happening simultaneously, but they are not yet coupled together. These lines often coexist in different dynamics, with different pacing — a deliberately anti-consensual strategy, in contrast to collegiate sections that are orchestrated with clarity. Out of this process of exploration a consensus nevertheless develops, so that the 'theme' emerges as the ultimate outcome of exploration and negotiation — and yet, by the close, there is still ambiguity about whether the theme is Greig's or Clapperton's. Mr McFall's Chamber is joined for this performance by the pianist Graeme McNaught and the violinist Cyril Garac. Tickets (£10, £8 concessions) are available from Edinburgh's Usher Hall, and Glasgow's City Halls.